Condemns an Informer to Death. German rabbi; born at Schlettstadt; lived at Strasburg in the second half of the fourteenth century. He was rabbi and head of an important yeshibah in the latter city, where he was highly respected by both his community and his pupils, when suddenly he was caused to act in a case which nearly cost him his life. The community of Strasburg about 1370 had among its members two informers ("moserim"), through whom it was constantly exposed to the depredatory incursions of the knights of Andlau. As the Jews could not summon the two moserim before the Christian court without involving the powerful knights, they appliedto their rabbi for assistance. The latter secretly constituted a court of justice, which condemned the two traitors to death, and the sentence was carried out on one of them, named Salamin. The second, however, made good his escape, and, having embraced Christianity, returned to his friends and protectors, whom he informed of what had happened. The knights of Andlau, followed by an armed mob, came to Strasburg clamoring for vengeance on the Jews for the death of their ally. The Jews, when questioned about the affair, told the magistrates that the man had been executed at the command of Schlettstadt. The knights consequently set out toward the latter's house, but Schlettstadt succeeded, probably through the connivance of one of the knights, in securing refuge, with his pupils, in the castle of Hohelandsberg, near Colmar. From this fortress he petitioned the leaders of the community to intervene on his behalf so that he might return to his home. But either they neglected his request entirely or their action in his behalf was not forceful enough to be successful; for he remained six years in confinement. Tired of waiting, Schlettstadt left his hiding-place in 1376 and went to Babylonia, where he brought a complaint before the prince of the captivity ("nasi") against the chiefs of the Strasburg community. The nasi, supported by the rabbinate of Jerusalem, wrote in Schlettstadt's favor a ban ("ḥerem") against the community of Strasburg, invoking against its members all the curses if they should persist in their refusal to interfere in his behalf. Carmoly ("La France Israélite," pp. 138-144, Frankfort-on-the-Main, 1858) and Grätz ("Gesch." 3d ed., viii. 12 et seq.) think that the prince who issued the ḥerem was the exilarch David b. Hodiah, and they identify the ban with the one published by Kirchheim in "Orient, Lit." vi. 739; David b. Hodiah lived almost two centuries earlier, however. Armed with this ban, Schlettstadt returned to Germany. He sojourned at Ratisbon, the rabbis of which town were terrified by the ban written by the leader of the Eastern Jews. They immediately wrote to the chiefs of the Strasburg community begging them to use all their energy in obtaining permission for Schlettstadt's return, and threatening that otherwise they would be put under the ban. As a result the desired permission was at length granted. On the day of his arrival all the Jews of Strasburg went out to meet him, among others his son Abraham. The latter, while crossing the Rhine in a boat in order to go to his father, met with an accident and was drowned. It is not known how long Schlettstadt lived after this event; but, as the narrator of the foregoing events (Joseph Loanz, whose narrative was published by Grätz in "Monatsschrift," xxiv. 408 et seq.) states likewise that a few years later (c. 1380) all the Jews of Strasburg were massacred, it is possible that Schlettstadt perished together with his community. Schlettstadt is particularly known for his abridgment, entitled "Ḳiẓẓur Mordekai" or "Mordekai ha-Ḳaṭon" (still unpublished), of Mordecai ben Hillel's "Sefer ha-Mordekai." Both Carmoly and Grätz think that Schlettstadt wrote the work in the fortress of Hohelandsberg. Although Schlettstadt generally followed Mordecai b. Hillel, yet in certain instances he deviated from his predecessor, and he also added certain laws which are not found in the "Sefer ha-Mordekai." That his work was considered as an independent one is shown by the fact that it is quoted, now alone, now together with Mordecai ben Hillel's work, by Israel Bruna (Responsa, No. 163), by Israel Isserlein ("Pesaḳim," No. 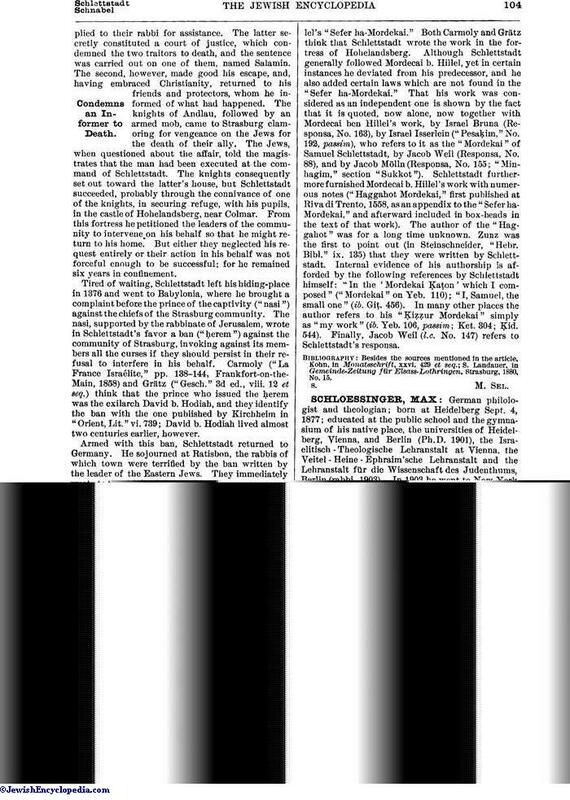 192, passim), who refers to it as the "Mordekai" of Samuel Schlettstadt, by Jacob Weil (Responsa, No. 88), and by Jacob Mölln (Responsa, No. 155; "Minhagim," section "Sukkot"). Schlettstadt furthermore furnished Mordecai b. Hillel's work with numerous notes ("Haggahot Mordekai," first published at Riva di Trento, 1558, as an appendix to the "Sefer ha-Mordekai," and afterward included in box-heads in the text of that work). The author of the "Haggahot" was for a long time unknown. Zunz was the first to point out (in Steinschneider, "Hebr. Bibl." ix. 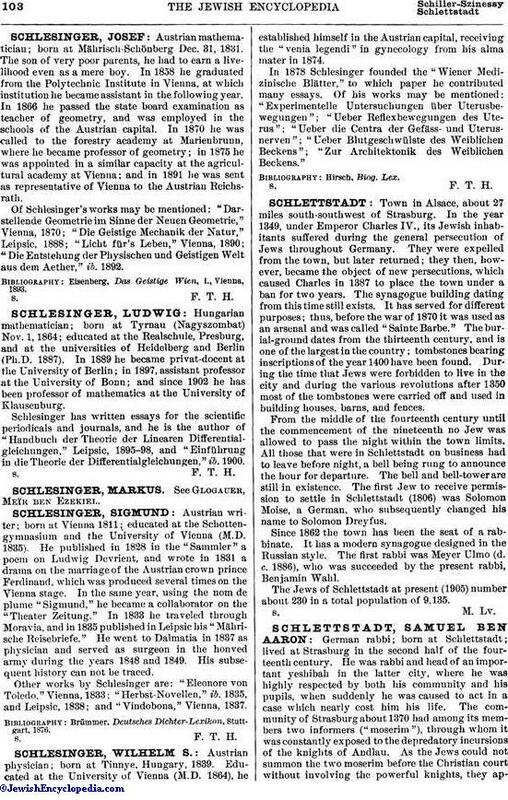 135) that they were written by Schlettstadt. Internal evidence of his authorship is afforded by the following references by Schlettstadt himself: "In the 'Mordekai Ḳaṭon' which I composed" ("Mordekai" on Yeb. 110); "I, Samuel, the small one" (ib. Giṭ. 456). In many other places the author refers to his "Ḳiẓẓur Mordekai" simply as "my work" (ib. Yeb. 106, passim; Ket. 304; Ḳid. 544). Finally, Jacob Weil (l.c. No. 147) refers to Schlettstadt's responsa. S. Landauer, in Gemeinde-Zeitung für Elsass-Lothringen, Strasburg, 1880, No. 15.